Authors: Vdovin V.M., Momot A.P., Orekhov D.A., Tolstokorov I.G., Shevchenko V.O., Krasyukova V.O., Shakhmatov I.I., Lycheva N.A., Belozerskaya G.G. Aim. To evaluate the hemostatic effect of fibrin monomer after its intravenous administration at different time periods in experimental trauma. Methods. In the experiments, in a placebo-controlled study, hemostatic and hemostasiological effects of systemic use of fibrin monomer were studied at different time periods after its administration (in 5 min, 1 h and 3 h) in 97 male rabbits of the Chinchilla breed in the controlled liver injury model. Results. A pronounced hemostatic effect was demonstrated for fibrin monomer used at a dose of 0.25 mg/kg demonstrated by a 6.3-fold decrease of blood loss volume (% of circulating blood volume) compared to placebo on the background of the intravenous preventive fibrin monomer administration 1 hour prior to controlled liver injury. Fibrin monomer administration at a stated dose was not accompanied by significant changes in haemocoagulative parameters including measurement of platelet count, activated partial thromboplastin time, prothrombin time, thrombin time, echitox time, fibrinogen concentration, level of soluble fibrin monomer complexes, D-dimer content, and antithrombin III activity. The effect of fibrin monomer is probably realized through some effectors, the nature of which has not yet been studied. The obtained results allow choosing the optimal interval between intravenous administrations of fibrin monomer and controlled liver injury for further study of the mechanisms of its hemostatic action. Conclusion. Fibrin monomer in small doses (0.25 mg/kg) is able to exert a pronounced hemostatic effect with its systemic administration 1 hour prior to the injury without significant changes in haemocoagulative parameters. hemostatic system, fibrin monomer, liver injury, blood loss model, systemic hemostatic effect, rabbits. Rossaint R., Bouillon B., Cerny V. et al. The European guideline on management of major bleeding and coagulopathy following trauma: fourth edition. Crit. Care. 2016; 12 (20): 100. doi: 10.1186/s13054-016-1265-x. Cap A., Hunt B.J. The pathogenesis of trauma­tic coagulopathy. Anaesthesia. 2015; 70 (1): 96–101. doi: 10.1111/anae.12914. Levi M. Management of bleeding in patients treated with direct oral anticoagulants. Crit. Care. 2016; 20: 249. doi: 10.1186/s13054-016-1413-3. Damage Control Resuscitation at Level IIb/III Treatment Facilities. Joint theater trauma system clinical practice guideline. 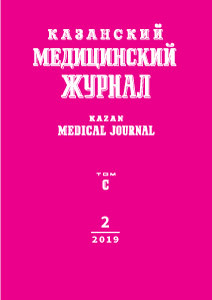 Feb. 2013. http://9thcall.ru/wp-content/uploads/2019/02/Management-of-crush-syndrome-under-prolonged-field-care.pdf (access date: 05.12.2018). Hayes B.D., Winters M.E., Rosenbaum S.B. et al. What is the role of reversal agents in the management of emergency department patients with dabigatran-associa­ted hemorrhage? J. Emerg. Med. 2018; 54 (4): 571–575. doi: 10.1016/j.jemermed.2017.12.061. Lambourne M.D., Eltringham-Smith L.J., Gataiance S. et al. Prothrombin complex concentrates reduce blood loss in murine coagulopathy induced by warfarin, but not in that induced by dabigatran etexilate. J. Thromb. Haemost. 2012; 10 (9): 1830–1840. doi: 10.1111/j.1538-7836.2012.04863.x. Weisel J.W., Litvinov R.I. Fibrin formation, structure, and properties. In: Fibrous proteins: structures and mechanisms. D.A.D. Parry, J.M. Squire eds. Subcellular Biochemistry. 2017; 82: 405–456. doi: 10.1007/978-3-319-. © 2019 Vdovin V.M., Momot A.P., Orekhov D.A., Tolstokorov I.G., Shevchenko V.O., Krasyukova V.O., Shakhmatov I.I., Lycheva N.A., Belozerskaya G.G.